The Department of Tourism (DOT) will be holding various fun activities in Intramuros in line with its “It's More Fun in the Philippines" campaign through the Intramuros Redevelopment Project. As a project kick-off, a free admission concert night dubbed as the Kultura...Musika...Saya! 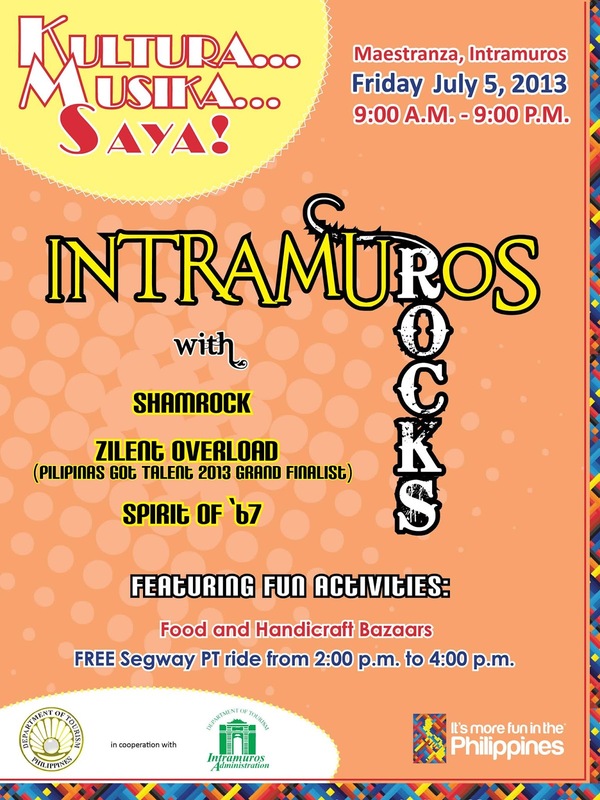 featuring "Intramuros Rocks" will be held on 05 July 2013, Friday at the Maestranza Park, Intramuros, Manila. The musical extravaganza will present different genres of music featuring famous bands and artists including Shamrock, Spirit of 67 and Pilipinas Got Talent finalist Zilent Overload. Aside from the concert, adding a more festive atmosphere will be affordable food stalls and bazaars offering local handicrafts, tribal arts and other novelty items within the newly restored Maestranza Park. The venue, also called Almacenes Curtain Wall, is situated right beside the historic Pasig River and was a former storehouse and soldier’s quarter during the Spanish time. 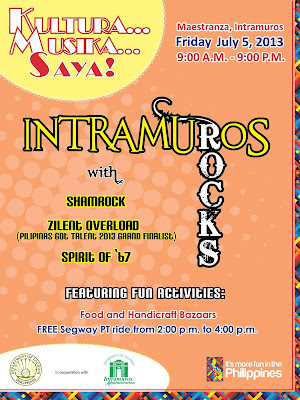 The Intramuros Rocks at Maestranza Park is a pilot activity of the many programs and events lined-up to happen in the walled city. The project aims to promote cultural appreciation and heritage awareness to the public, most especially the youth, and to revive Intramuros’ grandeur and glory as “the most distinguished and ever loyal city”. Apart from reinforcing the image and character of Intramuros as a rich cultural heritage, the project also intends to showcase Intramuros as a fun and relaxing place to stay. The Kultura ... Musika ... Saya! featuring "Intramuros Rocks" is being presented by the Department of Tourism in cooperation with the Intramuros Administration. For event details, please contact the DOT-NCR Product Development and Research Unit at 524-8311 and 523-8823 or the Tourist Information & Special Projects Unit at 525-2000 and 524-2384.